Yes, another one. Book #2 was no less disappointing than book #1. In fact, it was possibly an even more enjoyable read. I think part of the reason for this is, once again, the movie. 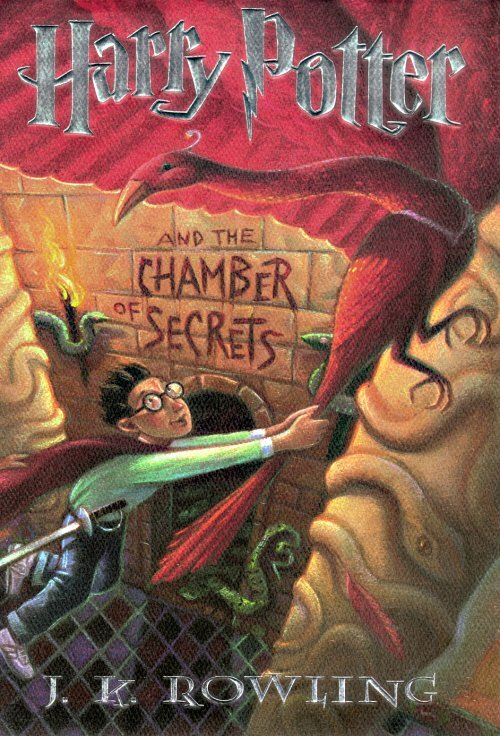 The Chamber of Secrets movie is probably the least-watched of the Harry Potter films in my collection (which includes all of the ones currently available on DVD), and now that I’ve reread the book I realize it’s a much richer book than I’ve been giving it credit for as of late. I remember being really annoyed with Dobby the first time I read this, but on all subsequent reads I’ve found little to no trace of that annoyance. However, I did find the final duel very interesting this time around. Lockhart’s memory loss was, as always, immensely entertaining and enjoyable for me. Fawkes’ role was much better done than I remember it being. And the scene with Aragog was far less extended and thrill-seeking than I thought it was.Possibly one of my favorite parts of this book is the presence of Fred and George. The Weasley twins are two of my favorite characters of all time (aside from Gabriel García Márquez’s character Melquíades, they’re the only literary figures I’d consider naming pets after), and they’re consistently involved in the book. Also curiously present is Percy Weasley, another one we don’t see a lot of in the films. I think the way the characters interact with each other here is done in that special way only books can do it in — they feel present and alive, and like they’re involved every step of the way. I guess that’s part of the charm of the books: the narrative voice is very skillfully constructed, and lends the stories a lightheartedness that’s somewhat lacking in the films.One more thing that they do in the book that delights me is the moment when we first see Harry’s ability to speak Parseltongue. In a film, you just can’t have that same kind of moment of confusion you have in the book where Harry speaks in English (and it’s narrated in English) only to be pulled aside by Ron and Hermione and informed that he spoke a different language without knowing it. That moment of confusion the reader shares with Harry is not replicable on screen, because when he speaks the words have to come out in a different language, and only Harry remains in the dark about what’s happened, even if the viewer is confused.So, once again, I have absolutely nothing critical to say about these books. They just bring me such joy! If you haven’t already read them, you definitely should!